>> Many people in this world are searching to find the answers to the reality of the world. But there’s a question that remains unanswered. There is a mystery human beings cannot solve: birth; aging; suffering and death. But there was someone, who found the answer. 2,500 years ago, someone was searching for the solution to these mysteries, seeking for the truth. At last he found it. >> The world is still searching, but today so many people are still seeking. And now those answers are available for you. Do the same as The Buddha, and you will find the same truth as The Buddha did. 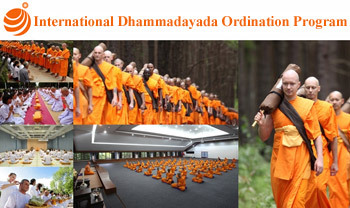 The International Dhammadayada Ordination Program is organized monthly to provide monastic training for foreigners in 3 languages Including English, Chinese and Japanese to help you practice meditation and understand the monk’s way of life. "You can follow the same path to enlightenment."